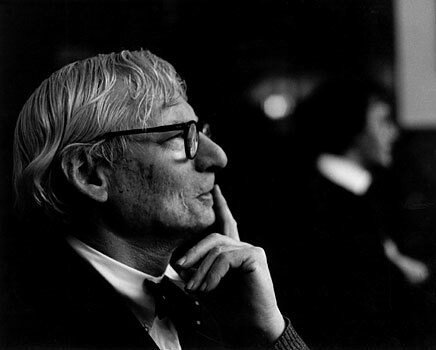 Architect Louis Kahn was passing through Pennsylvania Station in New York on March 17, 1974 when he was struck with a heart attack. He died within minutes. But his body was not claimed for three days because he had changed the address on his passport. Kahn’s sudden death was a tragic loss to the world, and an incomprehensible shock to several prominent New Yorkers. 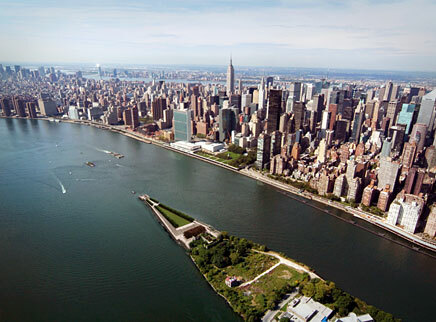 For, in his briefcase, Kahn was carrying the just-completed final drawings for the Franklin Delano Roosevelt Memorial he was to build on the southern tip of Roosevelt Island off Manhattan. His death was made even more ironic by its location: the replacement for the original Penn Station masterpiece of the Beaux Arts, the architectural tradition in which Kahn was first trained but later abandoned. The “Four Freedoms” speech was delivered by President Roosevelt on Jan. 6, 1941. In it he outlined a world defined by four basic principles: Freedom of Speech and Expression, Freedom of Worship, Freedom from Want, and Freedom from Fear. The speech marked the moment when the United States abandoned isolationism and shouldered its way onto the stage of global superpowers. For over 70 years, the “Four Freedoms” have guided and defined America’s foreign policies. Shortly after Kahn’s death, his plans were approved by New York State and ground was to be broken soon after. 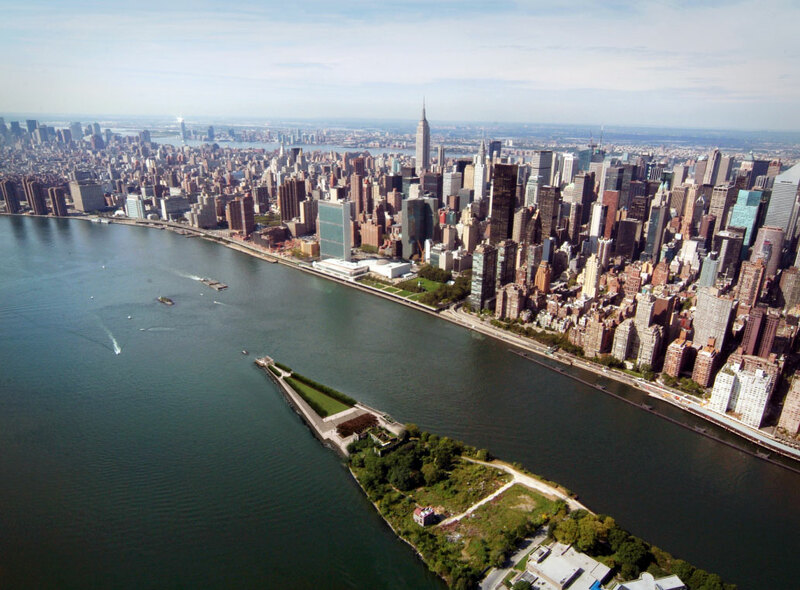 But then, as described by William vanden Heuvel, the chair of the Franklin D. Roosevelt Four Freedoms Park foundation, a “perfect storm” struck. New York City almost declared bankruptcy, plunging into a long fiscal crisis. And then-Governor Nelson Rockefeller, although a champion of the park, was named Vice President of the United States and left town. 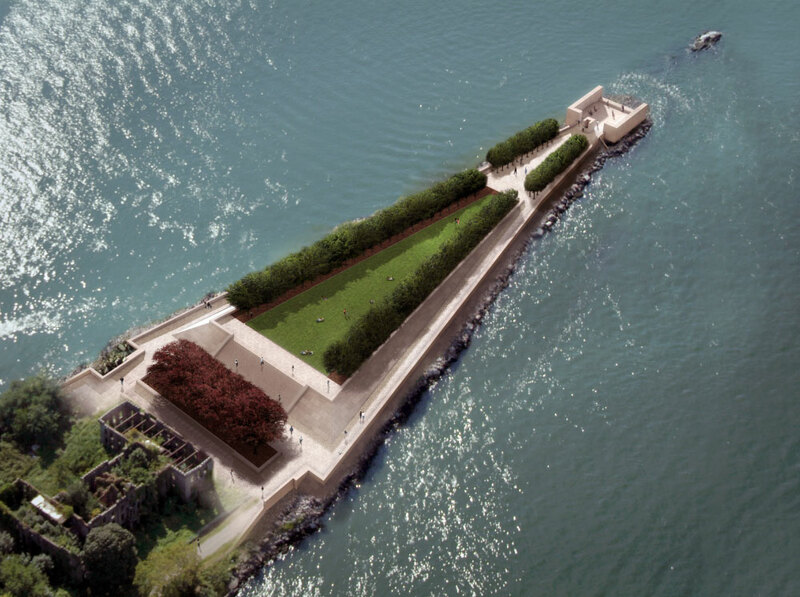 The park today will cost some $50 million, most of which has been raised through private donations. $10 million came in government funds and another $10 million as a gift from the Alphawood Foundation of Chicago. The work at the site so far has created more than 200 jobs for architects, engineers, stone cutters, landscapers and others. White granite walls will bear quotes from FDR’s speech, and this coming spring scores of copper beech trees and linden trees will be planted to flank a sloping lawn and an open-air “room.” A colossal bust of Roosevelt will sit in the room, in a triangle of land across the East River from the United Nations. Donors may purchase space on the walls for family names or they may donate some of the trees. “It’s an opportunity for people to have their names attached to what is going to be a world-class monument,” former Ambassador vanden Heuvel said. Kahn was born in 1901 in Estonia and was brought to the U.S. by his parents when he was five. He had a long and noted career as an architect, teacher and urban planner. But the FDR Park was his only project in New York. His other works include the Yale University Art Gallery, the Salk Institute in California, Phillips Exeter Academy Library in New Hampshire, and several buildings in the Far East. He was made a member of the National Institute of Arts and Letters in 1964, and was awarded the Frank P. Brown Medal in that same year. He was made a member of the American Academy of Arts and Sciences in 1968 and received the AIA Gold Medal in 1971 and the Royal Gold Medal by the RIBA in 1972. Even so, Kahn was somewhat of a late bloomer as an architect. He did not hit his professional stride until he was in his fifties. After visiting ancient ruins in Italy, Greece and Egypt, he progressed from the International Style to his own blend of softer modernism. Now if only they could do something about that akward space between Goldwater Memorial Hospital and the former Smallpox hospital. Isn't this kind of worthless to be honest? I mean, if they're going to reclaim any more land... shouldn't NY be doing so for housing or something more 'productive' other than a 40 year old park plan?